The Bosch GSA18 V-125K14 18 V EC Brushless 1.25 In. -Stroke Multi-Grip Reciprocating Saw Kit with CORE18 V Battery features the first cordless recip saw with orbital and non-orbital sawing action for superior cutting in materials from wood to metal. The GSA18 V-125 recip saw has an innovative and balanced angled-motor design, an efficient EC Brushless 18 V motor and corded-like power. Its three orbital settings (0-1-2) allow optimized cutting in all types of materials. The saw delivers 0-2,500 strokes per minute at a labor-saving 1.25 In. per stroke. For comfort, it has integrated Vibration Control counterbalance technology to limit vibration, a long, easily reachable variable-speed trigger switch and a toolless blade-change system. The CORE18 V battery is the best-built battery on the planet, (vs. leading power tool competitors) with next-gen Li-ion technology that produces 80% more power than previous cells. The battery's CoolPack 2.0 technology provides up to 135% more cooling effect than batteries without CoolPack. 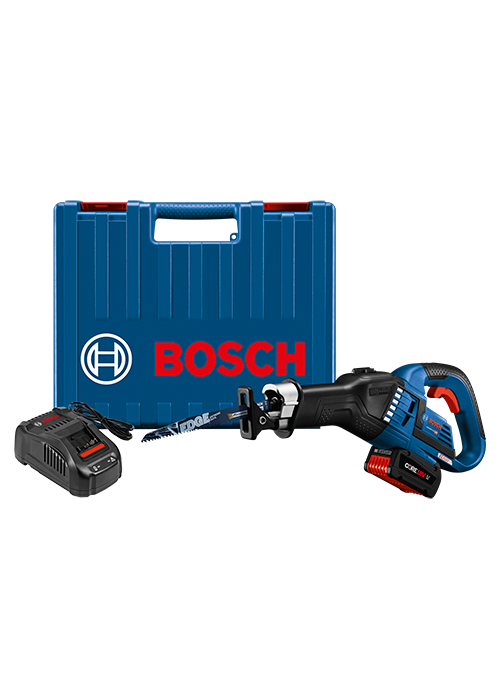 CORE18 V is 100% forward and backward compatible with all Bosch 18 V Li-ion tools and chargers. The fast charger charges a spent CORE18 V to 80% ready in only 41 minutes.